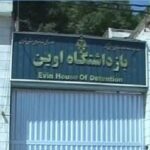 HRANA News Agency – There are more than 206 political prisoners in the 350 and women’s sections of the Evin prison. This includes both who have definite sentences and those who are under temporary arrest. Although the section 350 is one of the public sections of the Evin prison, the prisoners there are prevented from their basic rights like telephone contact or meeting their families.